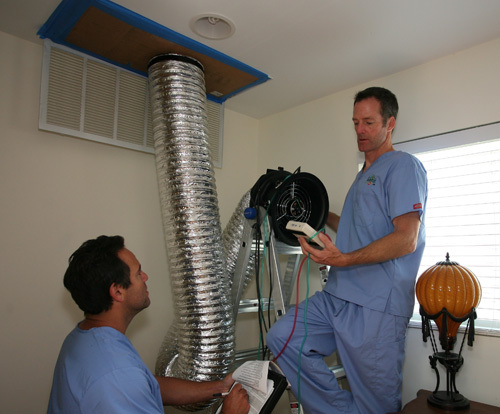 Building Doctors is the Los Angeles area expert in home performance and the healthy home. Our highly trained and BPI Certified team treats your house as a completely integrated system and is able to diagnose home performance issues through a comprehensive energy audit and implement energy efficient solutions for insulation, heating, ventilation and air conditioning. Learn more about our process and how we can help you save money on energy bills and reduce your carbon footprint! Building Doctors' energy audit combines building science and modern detection devices to evaluate your home's energy efficiency and health. Our detailed and comprehensive report addresses your concerns and recommends any necessary retrofits. Our licensed team can make all remediations and can help you save on your energy bills! Check out our video to learn more! 5 star. Perfect. Dan and his guys are top notch. He has the system down to a science. From the clothes to the truck to the tools to the contract. Not a typical bait-and-switch operation just trying to get your money. They want to help and do it right and give you all your options. I bought my silver lake home in 1996. It had an old furnace and wall ducts with some insulation. No central air. As the years passed and the climate changed my home became less and less comfortable. I had a wall unit for AC in the summer and my home was wasting energy. I would highly recommend this company. My wife and I had consulted multiple other HVAC providers prior to consulting with the Building Doctors and were very impressed from start to finish with the level of professionalism, the vision for the project and the quality of the work done. From the very beginning, my husband and I were impressed with the professionalism and expertise of Building Doctors owner and founder, Dan Thomsen. He was always available to answer our numerous questions prior to our doing the work and during the energy improvements. My house is so comfortable now and I wanted to let you know that my gas bill is lower than it's ever been in 23 yrs! Thanks for the great work, Susan F.
The Building Doctors performed a thorough energy audit in my home and identified problem spots I was never aware of. Their report was so easy to read, and outlined the most cost effective fixes. They completed the ones I chose, and my energy bills dropped over 40%! You and your company, The Building Doctors, have been quite helpful in getting my house more energy efficient. And besides that, you're really nice. You were quite professional in your performance testing on my house, including making sure that the cats didn't go out the door. I originally hired The Building Doctors to conduct a comprehensive home energy audit and complete a HERS (Home Energy Rating System Report) on our 1930’s Spanish house. Dan immediately impressed me with both his extensive knowledge in the field and his professionalism and responsiveness. For some years we had been paying through the nose to heat our home in the winter, and finding it impossible to cool our home in the summer. Regardless of the definition or metric used for a Net Zero Energy Building, minimizing the energy use through efficient building design should be a fundamental design criterion and the highest priority of all NZEB projects.